A Facilitator is an individual who makes this interactive music making experience “easier” for the participants. A Facilitator on the most nominal description, is creating a space for the expression of a community. Trained professional facilitators recognize the need for empowering each individual as the consciousness of the entire group evolves into a musical composition. Professional Drum Circle Facilitators can help design an event that can be seemlessly incorporated with your event. Drum Circle Facilitators are act in service to the group, helping individuals achieve greater personal potential, shared joy, and interdependent group dynamics. 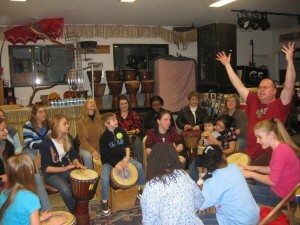 A Facilitator develops a rapport with the participants and through various techniques is able to assist the music into various compositions unique to the population. These compositions become musically sound as the facilitator guides the group to listen and explore their personal expression interacting as an audible organism. Trained Facilitators have a consistent style and technique often inspired by the various communities they regularly work with.